Lighter than glass or ceramic growlers and virtually indestructible, these stainless steel growlers may be the ultimate vessels for storing and toting your homebrew or draft beer favorites. Tight sealing, swing top cap with D ring for convenient carrying. 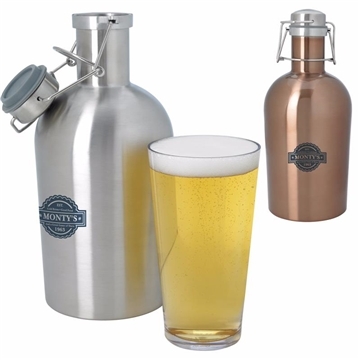 Overall Reviews: WRITE A REVIEW (9)5.005Stainless Growler - 64 oz. It was a very good product for the cost and we were trying to be economic AnyPromo has the best selection of promotional items at a reasonable cost. The turnaround time is quick! We ordered them plain but they were very well received by the company employees who received them. Very good sturdy quality. It was easy to get a good feel for the coloring of the product from the design phase. Individuals are requesting them, I might have under purchased. This item was included in our quality incentive program.